Some restaurants close overnight, while others die a long, lingering death over a number of years. Their prognosis might be terminal, the chef might be mad, but you couldn’t beat the life out of them if you tried. Is Franco Rossi one of those restaurants, clinging to the high rise ledge of gastronomy by its manicured fingernails? For many years it has stood on the same corner site in downtown Bologna and it ain’t going anywhere without a fight and a long stemmed rose for the laydee before she leaves. Its entrenched reputation as one of the best restaurants in Bologna precedes it like a tongue of red carpet rolled around the world, ensuring a steady stream of international visitors from the regular trade fairs and conferences held here. Being mentioned in a best selling John Grisham novel can’t hurt either. A scene in ‘The Broker’, first published in 2005, finds exiled Washington power broker Joel Backman dining here, as assorted government agencies plot to kill him. You have to hand it to Grisham. 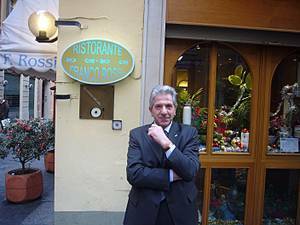 Franco Rossi is exactly where a Washington power broker would eat in Bologna. Unthreatening, deeply reassuring dishes such as ricotta ravioli with gorgonzola sauce and fillet of veal with white truffle are just what’s needed for sustenance when Mossad are on your tail. The question is however, it might be good enough for fiction, but is it good enough for the harsh reality of Are You Ready To Order? Certainly, this restaurant has many good points. Franco Rossi himself, for a start. In his elegant dark suit and clipped grey hair, he twinkles with the kind of charming, old fashioned hospitality that, ironically, is all too rare in the hospitality industry. This lunchtime, he hangs up our coats with the animation of one who has waited all morning to do just that; I salute his professionalism. Behind the swinging door, brother Lino Rossi is the chef, specialising in gutsy interpretations of the traditional cooking of the region. Nothing too outrageous, of course. Nothing to frighten the cavalli. He might do something like add slices of green apple to a starter of raw porcini mushrooms, and serve them with flakes of parmesan cheese and a slug of good olive oil. Meanwhile, all the Bolognese classics such as tortellini in brodo and tagliatelle al ragu, are left to speak for themselves. Franco Rossi is a small, family run restaurant with tables in the basement and ground floor. The interior is a quiet study in conservative gentility; ten tables or so are dressed with rich, blue damask, complete with matching napkins. There are prints of the Italian countryside on the walls and some impenetrable bits of folk art, including an unfurled fan trapped behind a giant dome of plastic, and a bolt of glittery, orange net wrapped around a sheaf of fake roses. The tables have candles, lit at lunchtime, while crocheted doilies sit on the charger plates like lacy, fried eggs. It is the kind of place where the men are given blue menus with prices and the women are given pink ones without. Franco, whose resemblance to the actor Frank Finlay is so startling that I expect him to appear in a powdered Casanova wig at any moment, dispenses glasses of chilled prosecco and explains amiably that the restaurant never won any Michelin stars because the tables are too close together. It certainly is cosy, but not oppressively so. The theory, I mean, not the restaurant layout. There is a standard a la carte, with fish dishes – such as octopus carpaccio, lobster spaghetti, swordfish with tomatoes and black olives - listed separately under their own section, and a special ‘The Broker’ set menu, in tribute to the Grisham book. When we eat here over Christmas, it features the porcini and apple starter mentioned above, followed by tortellini in brodo, then fillet of veal with white truffles, carrots and potato puree, followed by panna cotta for dessert. Yours for 50euros, including local wine, which seems like a terrific deal. Yet today, the carte is just too tempting. We order starters of smoked goose breast and a vegetable torta with leek sauce. Then two pasta dishes - pumpkin tortelli and garganelli with fresh porcini - followed by main courses of rabbit roasted with apples and a fillet of beef. It is not all perfect. The goose is excellent, and benefits from being hand carved into slices thicker than the usual hammy wafers. Yet it is served with a boring mix of chopped salads, which seems a trifle lazy, considering the splendid central item. The torta is a mess, with soggy pastry holding an indiscriminate rubble of vegetables, topped by a puree of Jerusalem artichokes. It all breaks apart in an unconvincing, amateur manner. However, the accompanying artichoke mousse, made in a dariole mould, is a revelation; an intense level of earthy flavour somehow contained in the lightest of structures. Garganelli, a kind of hand rolled penne, is served with wild porcini – a house speciality – and more flakes of parmesan. It is superb, a textbook version of the kind of wintry dish one dreams of having when in Italy. Pumpkin tortelli is another local speciality, although the filling is a touch oversweet and the thick, egg-rich pasta a little overwhelming. One main course – the beef – is a hit; slices of flavoursome, rosy meat cooked fiercely and quickly, then showered with chips of roasted garlic and rosemary. After this simple elegance, the rabbit is more overwrought. Wrapped in spinach and pastry – clearly not this kitchen’s strong point – it sits on a bed of sugared, cubed apples and specks of flavourless black truffle. It all seems a flourish too far, when a simpler method of cooking to enhance the flavour of the rabbit, not bury it in a hutch of soggy pastry, might have worked better. Some of the puddings are, as S reports, a ‘splodgy mess’, but there is a very good semi-freddo studded with nuts that keeps him happy. Franco twinkles back to offer ‘the cakes of my family’, which are little squares of chocolate sponge plus cubes of one of those delicious, damp orange cakes, soaked with citrussy syrup. The wine list stretches back into the mists of time and has much to offer. to both the connoisseur and the diner who is happy with a nice, inexpensive bottle of something local. Our Sergio Zenato Amarone Della Valpolicella Riserva 2000 (75euros) is a lovely, chocolately wine with beautiful fruits and great depth. At this price, it is a very good buy, and there are other similar well priced wines on a list that is worth studying. Overall, the great thing about Franco Rossi is that they use absolutely top notch ingredients, and use them generously. The quality of everything, from the porcini to the beautifully made garganelli to the smoked goose, cannot be faulted. They even have pecorino di fossa on their cheese selection, a hard-to-find speciality that is buried underground for months to ripen. Yet some of the cooking is unruly, especially with the more inventive dishes. Franco Rossi is not dead yet, but an air of past grandeur does cling to its idiosyncratic fittings. 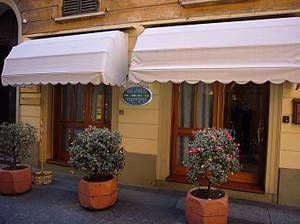 However, although it is the kind of Italian restaurant in Italy that many like to dismiss on the grounds that it is popular with tourists, it is much better than that. Don’t forget that the locals like it, too, and they are very hard to please. Franco Rossi, Via Goito 3, Bologna. Tel: 051 23 88 18. Lunch or dinner for two, excluding drinks and service, 100 euros.